Venus last appeared in the morning sky in 2015 and 2016, when it appeared with Mars and Jupiter. Brilliant Venus zips into the morning sky during April 2017 and dominates the morning sky until year’s end. 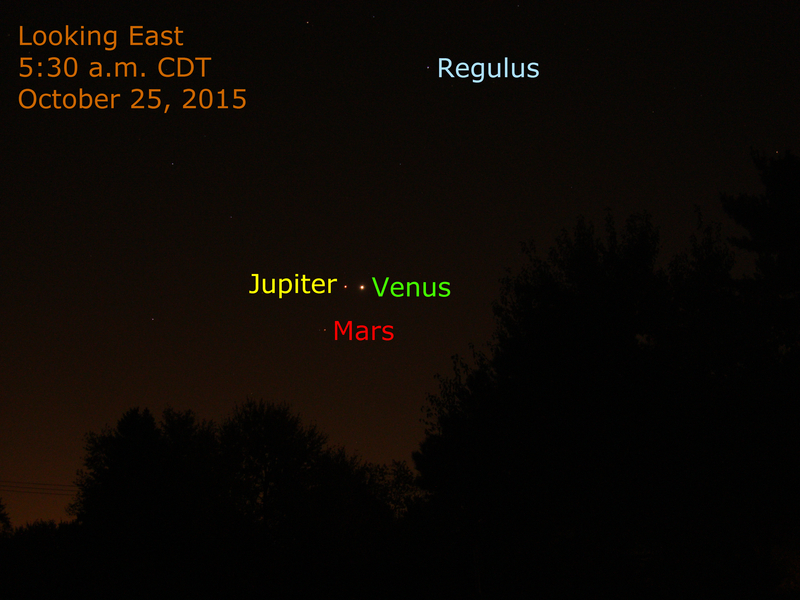 During this morning appearance, Venus makes close appearances with the star Regulus and the planets Jupiter and Mars. This chart shows the rising time of bright planets, the moon, and stars near the planets’ orbital plane (ecliptic) compared to sunrise as calculated from U.S. Naval Observatory data for Chicago, Illinois in the Central Time Zone. Additionally, the times when Jupiter sets and Saturn sets are charted compared to sunrise. On April 7, Jupiter is at opposition and it sets in the west at sunrise. The time differences are also displayed for Civil Twilight, Nautical Twilight and Astronomical Twilight. At Astronomical Twilight, the sky is as dark as it gets naturally. 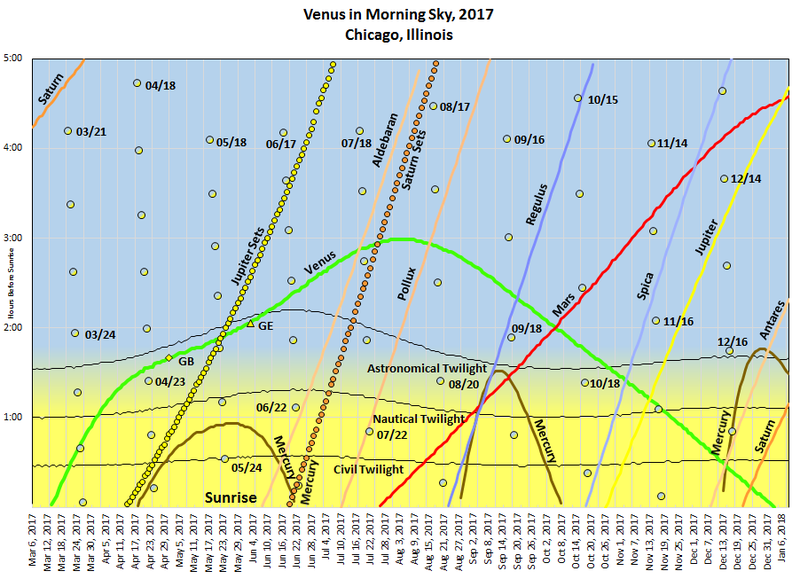 The rising time of Venus is represented by the green line on the chart. It enters the chart in mid-March, reaching its maximum rising time difference during the summer, and leaves the sky in early 2018. 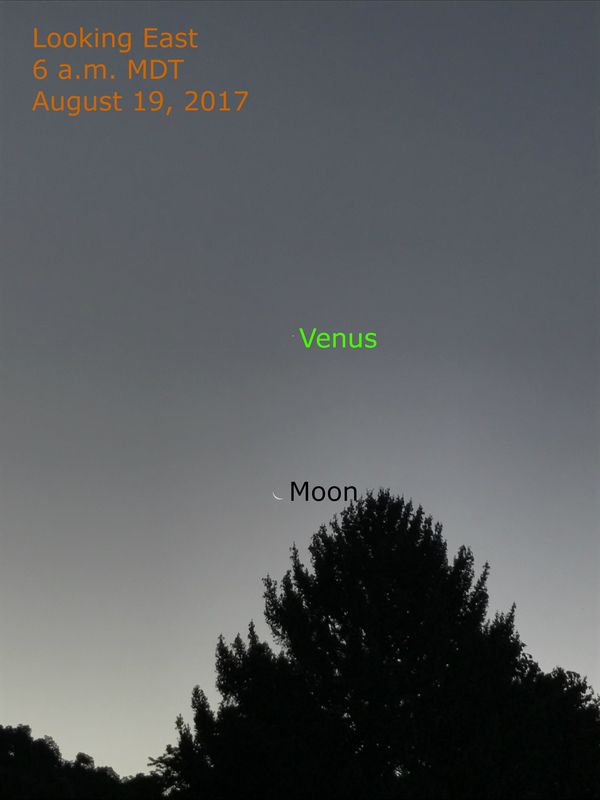 Notice that during the summer months of this appearance of Venus, the brilliant planet rises well before the beginning of twilight. It stands low in the eastern sky as the sky brightens. As Venus appears earlier in the morning sky, Jupiter shines brightly in the western sky, until about May 20 when Jupiter sets as Venus rises. (Notice on the chart, Jupiter sets line crosses the Venus rises at May 20.) After this date Jupiter sets before Venus rises. Similarly, Saturn, while not as bright as Jupiter or Venus, reaches opposition on June 15, setting in the west as Venus rises in the eastern sky. Venus appears in the eastern morning sky and Saturn appears in the western sky until about July 25 when Saturn sets as Venus rises. After this date Saturn sets before Venus rises. Later in the year, Venus appears near Regulus. This occurs near the date when the rising lines of Regulus and Venus intersect. The same occurs for Mars, Spica, and Jupiter. As Venus moves back into bright sunlight later in the year, it appears near Mercury, Antares and Saturn, although they appear together during bright twilight and out of view for most observers. 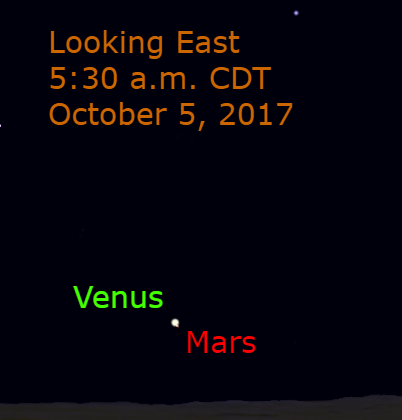 Venus has a close conjunction with Mars on October 5, followed by a very close (Epoch) conjunction with Jupiter on November 13. The moon passes Venus each month, as our nearest celestial neighbor moves through its celestial path. 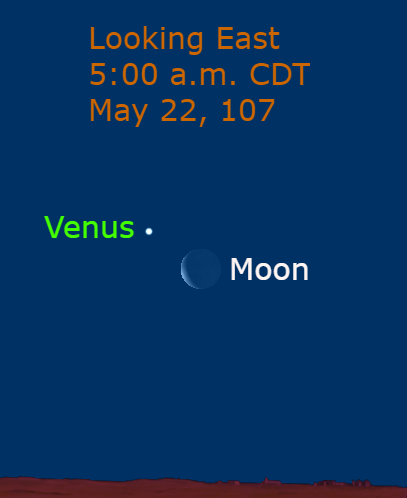 Two dates (May 22 and July 20) are especially noteworthy when Venus and the moon appear about 3.5 degrees apart. 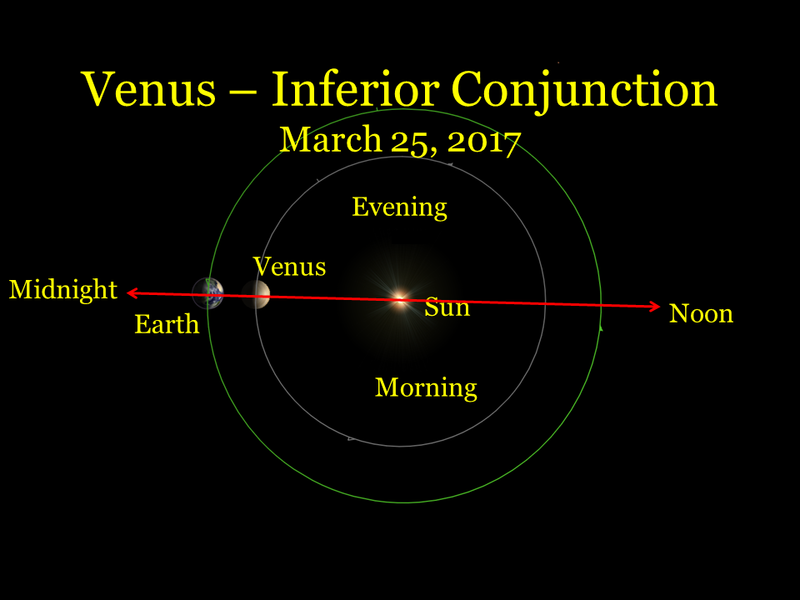 Venus moves between Earth and Sun on March 25, 2017; this is known as inferior conjunction. Since Venus has a shorter orbital path and faster speed, it quickly moves into the morning sky. The red line on the chart shows the division between morning and evening. The line pointing from the earth to the sun indicates noon. So at inferior conjunction, Venus rises with the sun, appears in the south at noon, and sets in the west at sunset. Venus does not appear in the sky at midnight at mid-northern latitudes. That occurs when a planet is opposite the sun in the sky as seen from Earth. On the chart notice that the midnight line does not point toward Venus. As Venus reaches this inferior conjunction, it passes above the sun. Because it is north, above the sun, it rises earlier than the sun. On conjunction morning it rises about 40 minutes before the sun. On the rising chart above, it first appears on the chart on March 14, 11 days before it reaches conjunction! Venus was last at inferior conjunction on August 25, 2015, 589 days between inferior conjunctions. The planet rapidly moves into the morning sky, rising earlier each morning. It is very close to our planet and sparkles in the morning sky. The brightness is from the proximity of the planet to Earth, its highly reflective clouds and the phase of the planet. (Yes, Venus shows phases when viewed through a telescope.) At this time Venus is about 170 times the moon’s distance, relatively close compared to other planets. 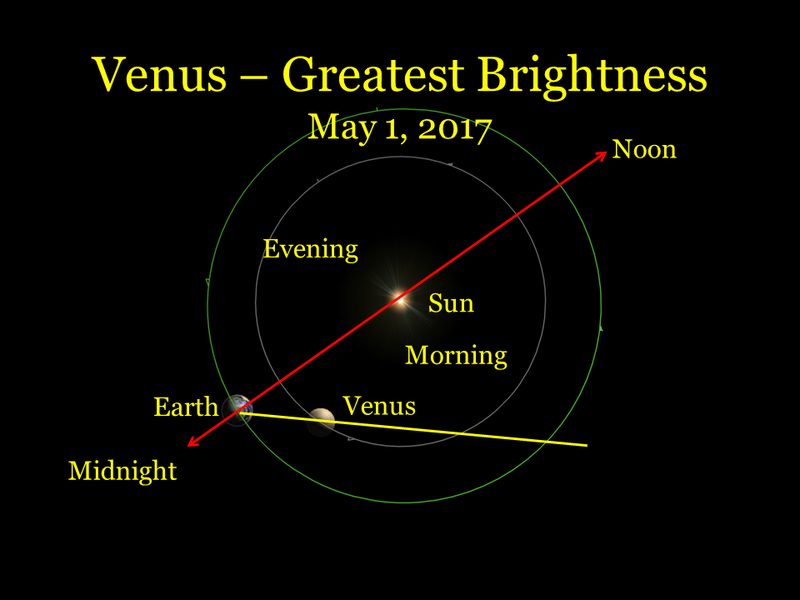 From April 15 through May 13, Venus appears brightest in our skies, with the mid-point on May 1, 2017. This is shown with the GB (greatest brightness) designation on the rising chart above. Update: This image is from the beginning of the period of peak brightness. Venus rises during twilight during maximum brightness during this appearance. Venus continues to rise earlier each morning. On the morning of May 22, the crescent moon appears about 3.5 degrees from Venus. 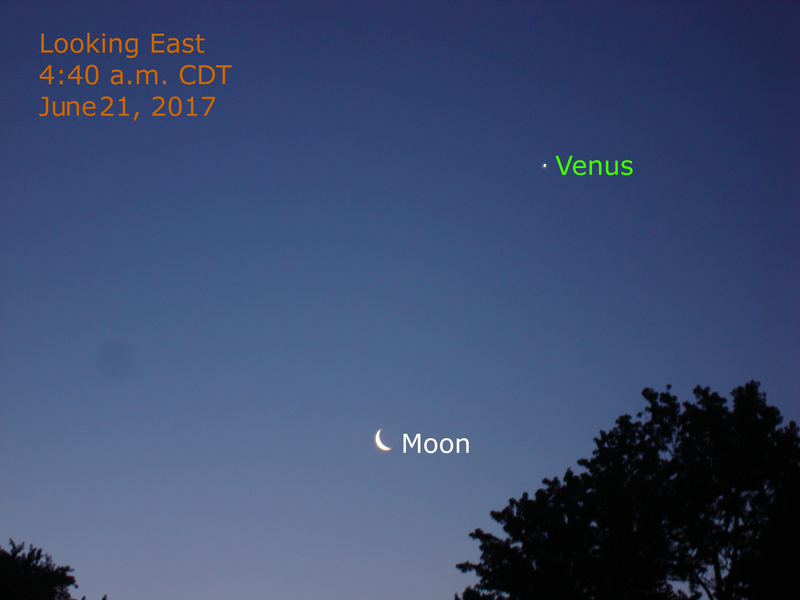 Update May 22: Venus and the moon appear together. 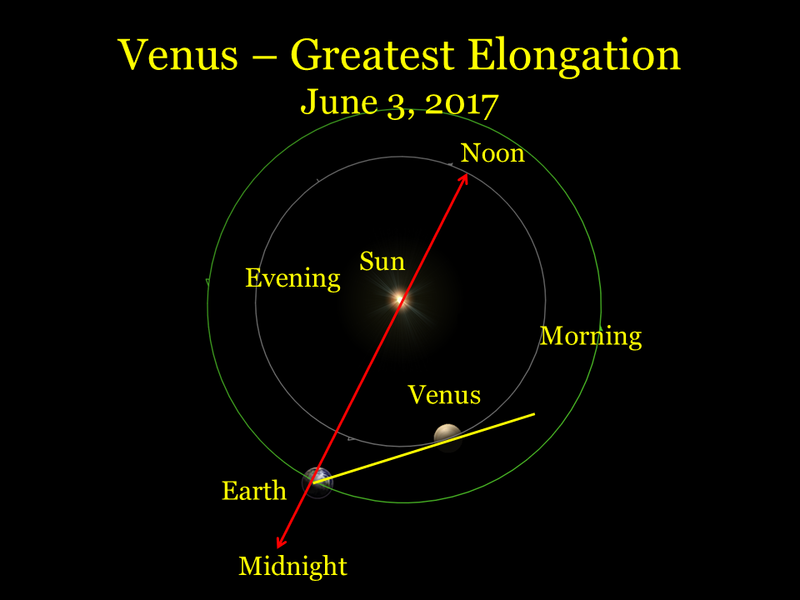 Venus reaches its greatest angular separation (46 degrees) from the sun on June 3. This is shown by the GE symbol (greatest elongation) on the rising chart above. It rises about 2 hours before sun near the beginning of twilight. Venus continues rising earlier as summer begins. 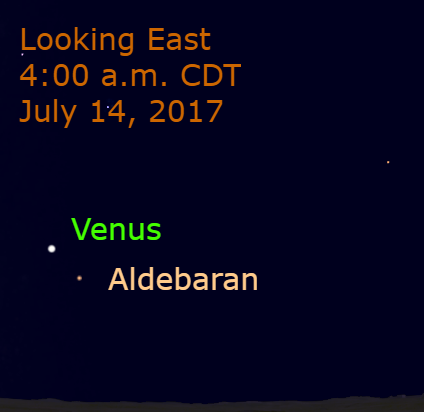 On July 14, Venus moves past Aldebaran. The closest approach is about 4 degrees. 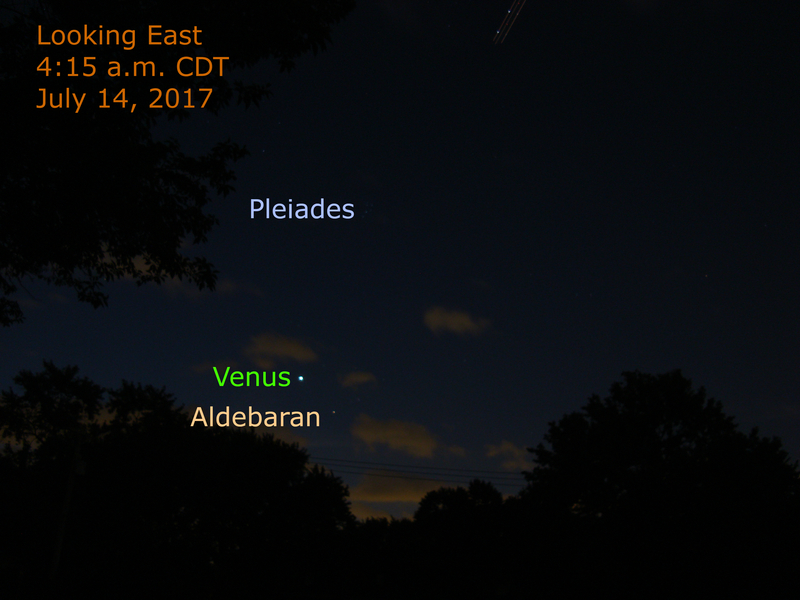 Update: Image of Venus and Aldebaran on July 14, 2017. 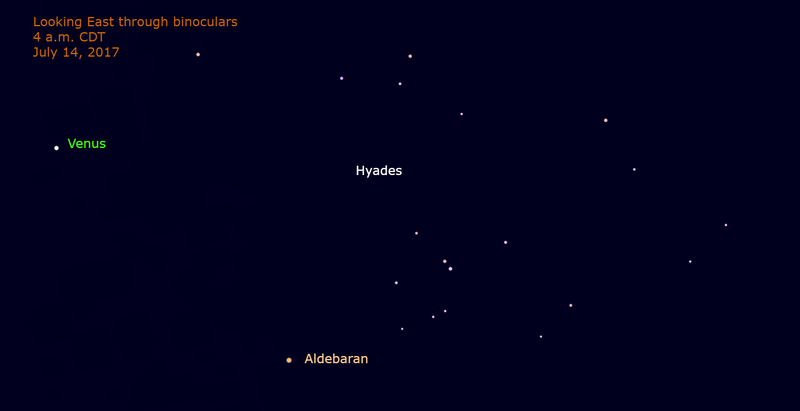 Click the image to see the Hyades and the Pleiades. 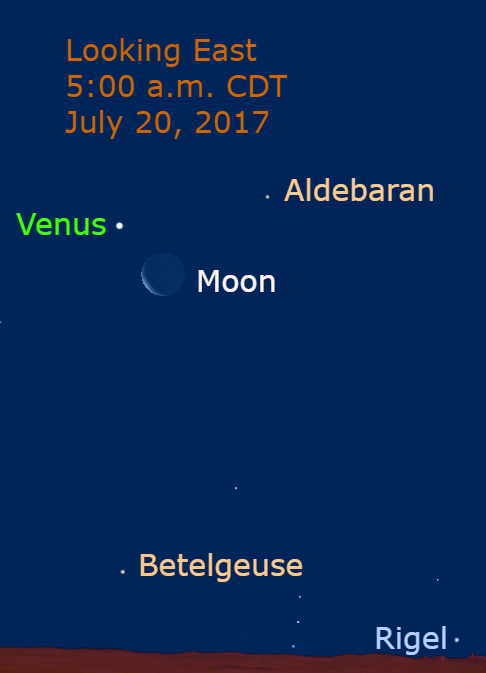 In early August Venus rises about 3 hours before sunrise and begins to rise later each morning as displayed on the rising chart. For the rest of the year, it loses about 30 minutes each month. On September 1, Venus passes about 1 degree from the Beehive star cluster. Like the Hyades described above, this is a stellar nursery. It is too far away to be easily seen. Binoculars will help with the view. 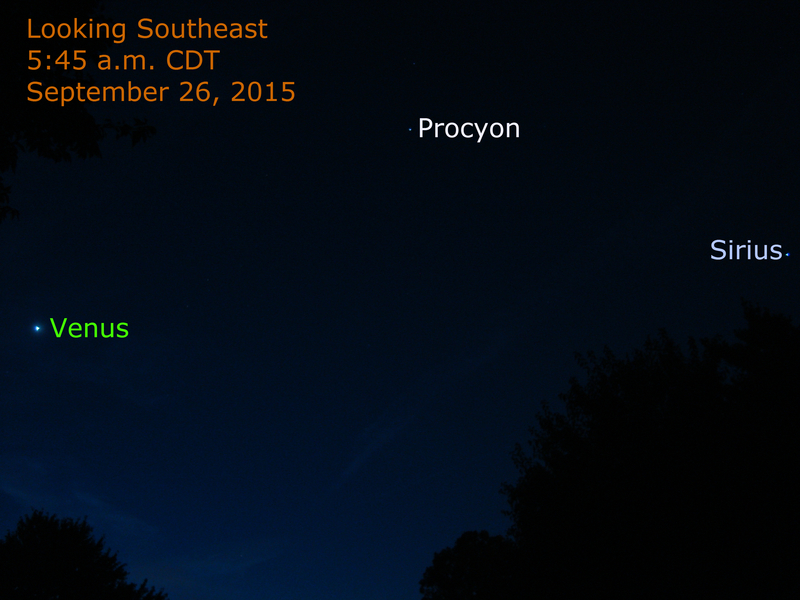 Look around 5:15 a.m. CDT. In late summer and early Autumn look for Venus and Sirius at the same time. Both are about the same height (altitude) above the eastern horizon. Venus stands in the east-northeast and Sirius appears in the southeast. Only the sun and moon shine brighter than Venus and Sirius is the brightest star in the night sky. See this link to view the last time Venus and Sirius appeared together in the morning sky. 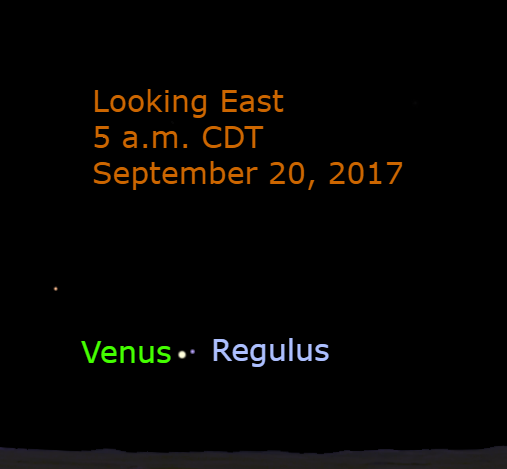 Venus continues its rapid eastward movement as compared to the stars and descent toward the sun’s glow, passing about a half degree from Regulus on September 20. This pair rises about 2 hours before sunrise. 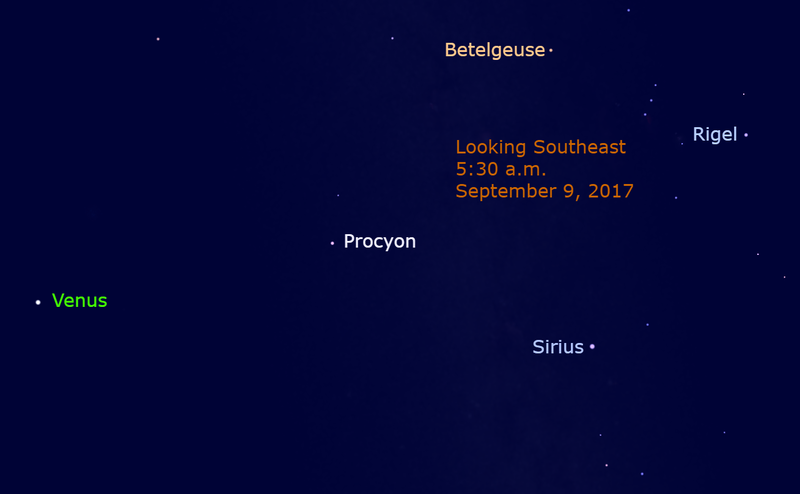 Update: September 20 — Brilliant Morning Star passes about one-half degree from Regulus. Over a month later, Venus passes Spica. The gap is nearly 4 degrees. 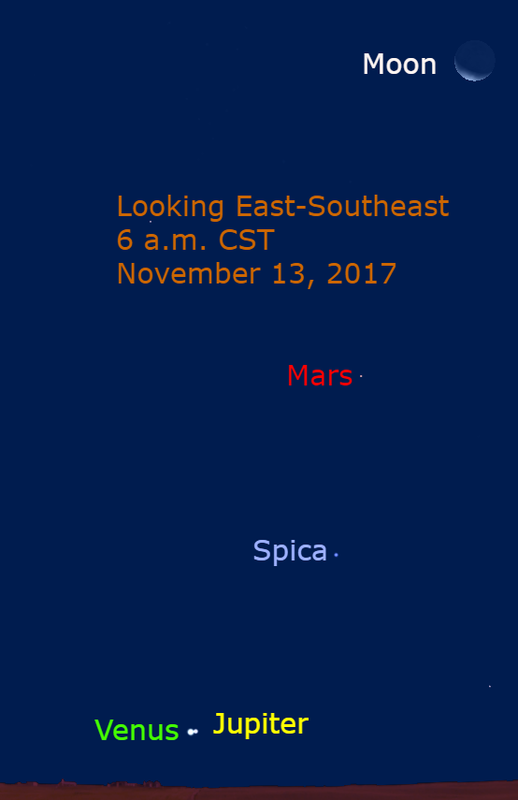 The first planetary conjunction of this appearance is with Mars. 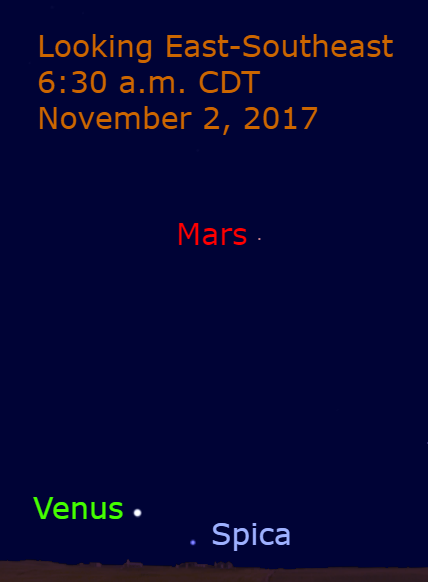 On the morning of October 5, Venus passes 0.2 degrees from the Red Planet. The planets are close on a few mornings before and after the conjunction. For more about Mars’ appearance during 2017-2019, see this article. Another Epoch (close) Conjunction of Venus and Jupiter occurs before sunrise on November 13. The distance is about .2 degrees. This conjunction is visible during twilight as the pair rises about 70 minutes before the sun. The next conjunction between the pair is January 22, 2019 with the next epoch conjunction on April 30, 2022. For more about the Venus-Jupiter Epoch Conjunction, see this article. Venus continues its rapid descent into bright sunlight. Conjunctions occur with Mercury, Antares and Saturn, but they occur in bright twilight, out of the view of most observers. 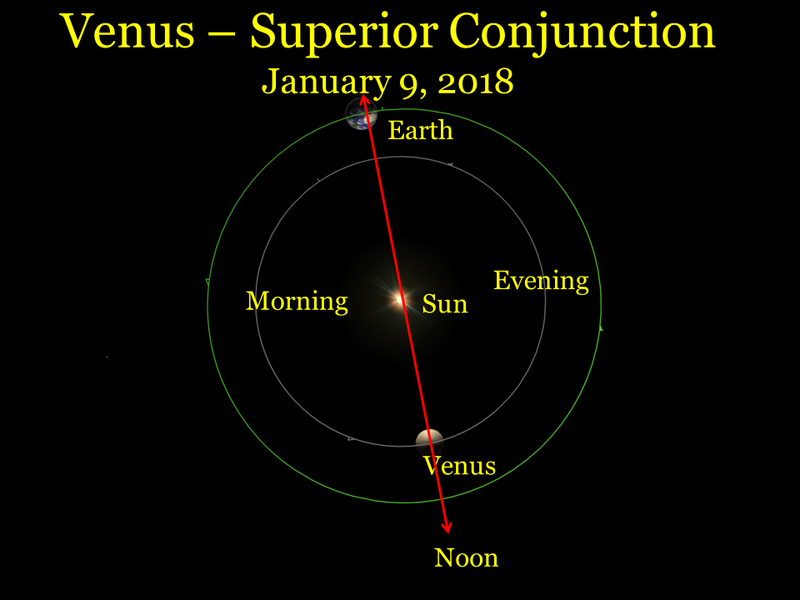 On January 9, 2018 passes behind the sun at its superior conjunction and reappears in the evening sky. Venus and Mars, 2.5 degrees apart, October 1, 2017. Venus and Mars, 1.75 degrees apart, 3 days after conjunction, October 8, 2017. Venus and Mars, 6.5 degrees apart, October 16, 2018. Venus provides a dazzling view of planetary, stellar and conjunctions during its morning appearance in 2017. Thank you. I’m enjoying the morning sky in B.C. Canada. There’s more there- Venus and Mars next week and Venus and Jupiter in November.